250 News | Horgan and Ministers to Visit P.G. Horgan and Ministers to Visit P.G. Prince George, B.C. 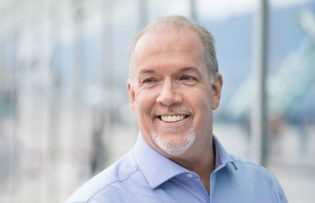 – British Columbia Premier John Horgan is headed to Prince George today. His media relations director confirmed the news this morning. Horgan will be joined by Forests Minster Doug Donaldson, Minister of Public Safety and Solicitor General Mike Farnworth and Parliamentary Secretary for Emergency Preparedness Jennifer Rice. The Prince George appearance will follow a tour of Williams Lake with Prime Minister Justin Trudeau and his ministers today. So far no media availability to meet with Premier Horgan has been scheduled. Horgan last visited Prince George during this spring’s provincial election campaign. I thought most of the evacuees have already left? All of the people of PG and the other places that took in the evacuees were directly affected by the wildfires . The treasury , organizers and volunteers from PG are still in PG . It’s not just the evacuees . From Mister mayor all the way down the command chain deserve accolades . PHOTO OP’s, you forgot it is PHOTO OPS… I think he is trying to get a competition on between himself and Trudeau as to who can get the most air miles in and do nothing. Clearly not. A later story says he came late in the day and no photo op. Assumptions sometimes belie the facts. So, if not for a photo op, then out of real concern, perhaps. I think many may be coming back due to conditions going from bad to worse…. Great more wind and hot air. I find the silence from Christy very refreshing. Her stepping down from politics makes me think she is having a temper tantrum. All was good when she ran and it looked like she might win again but as soon as she lost the lower lip came out and now she is giving the big finger to all those in her area that voted for her. So it is really hard to feel sorry for her. Bye Bye Clark, doubt too many will miss you, enjoy your snit. Nobody would let her have her way so she took her ball and went home. Most party leaders will resign when their party loses. I think she showed a great deal of class by stepping away when she did. That may be true, Axman, but in her case she said more than once she was going to stay on as leader of the opposition. Her resignation is just the final “miscommunication” she made and typical of Liberal reliability. Sometimes it’s difficult to step away from something you’ve devoted a great deal of your time and energy towards. I can’t fault her for taking the time to ensure she was comfortable with the decision. She could have clung on like Dix and James but she didn’t. I give her props for that. OK, children, lets move on. First page in the next chapter of BC under new leadership. Get with the program and say nice things not only about our politicians but to each other. It will not be a new chapter and new leadership, if tweedle dumb leaves out tweedle dee. Your comment has much depth. Well, Tweedle Dumb went home and Tweedle Dee now leads the Liberals, so??? Mangled the spelling but I’m surprised to have two Charles Dodgson fans here . Isn’t it tweedledum and tweedledee ? Been looking through the looking glass to find analogies ? Not really, although I did notice that the Cheshire cat resigned! The only reason why they both showed up in BC at all is because Justin has nice hair and Horkgan has none. Interesting to note that Glow Ball TV didn’t mention one word about our premier touring the Cariboo and PG. I guess they will continue to support the Lib/Con coalition in BC. I don’t hold any hope that Black Press (PG Citizen) will be any different.